Taking our Indian tribal tour forward, we now move to the Konyak tribes of India. Traveling to see these Indian tribes is a delight because of their unique culture and festive atmosphere. 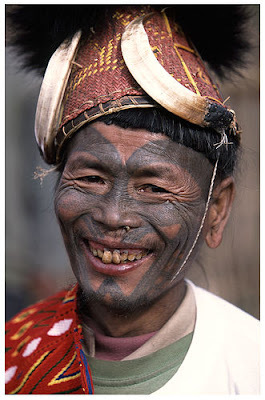 Mon district of Nagaland is the prime inhabit of Konyak tribes of India. These Indian tribes have a wonderful social culture. Also Konyak tribes are skilled artisans and craftsmen. These Indian tribes are ruled by hereditary chiefs called Anghs. The festive season amongst these popular tribes of India is Aoling Monyu and it is celebrated in firsr week of April. Labels: indian tribal tour., indian tribes, konyak tribe, konyak tribe of india, popular tribes of india, tribes of india.